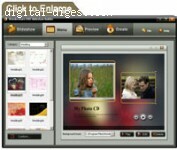 Create photo and video slideshows on CD/DVD/HD-DVD/Blu-ray Discs. Download a trial version of Wondershare DVD Slideshow Builder. No Time limits! No feature limits! Fully functional! 30 days for free trial. Shooting video and taking pictures is fun. But then what? Make a movie of your memories on DVD with the powerful and innovative Wondershare Movie Story. It's pretty easy to create a customized DVD slide show. Just add your photos and videos to your show, and use the Storyline to add music, transitions, motion effects and more. 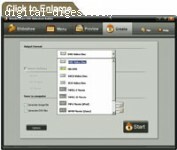 Built in, advanced menu designer produces beautiful DVD menus faster and easier. Wondershare DVD Slideshow Builder makes it all simple! Fine tune your pictures with useful photo editing tools like instant contrast/brightness adjustment. Powerful video editings make you be the Steven Spielburg of your home. Add impressive style with music and narration. Audio trimming and fade in/out support. Add fun with text captions and animated/static cliparts. Breathe life to your digital photos with stunning photo motion & transition effects. Get creative with Powerful Menu Designer. Burning and sharing the love on TV with your friends and family.